Bromley cross plumbers thermal heating services are an established firm working in Bromley Cross. We are dedicated to resolving your plumbing problem no matter how big or small. Is your boiler playing up? Our qualified boiler repair experts are on call now waiting to resolve your problem. We are a COGI registered company who pride ourselves on quality work and customer satisfaction. Our experts are here to help and only one call away from fixing your boiler issues for good. Are you looking to upgrade your boiler with a new replacement unit? We can supply and fit your boiler for you, with our team of professionals no job is to big or small. By upgrading your boiler system, you can save money on energy bills saving you in money in the long run. Our installation engineers are only one call away and offer friendly informative support about upgrading your current system for the most cost effective energy saving equipment. Are you looking to revamp your whole central heating system, or just looking to upgrade from an existing traditional heating system? 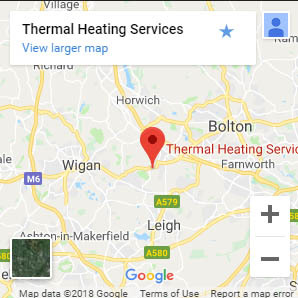 Look no further than thermal heating services we offer competitive rates and give you the best solution for your home or business. Underfloor heating is when you lay pipes breath your existing floor they are then feed by a central heating system by pushing warm water into the pipes beneath the flooring. It is a more cost effective way of heating your home and is becoming more and more popular way to heat your home. If you’d like to know more about our services please contact us directly.